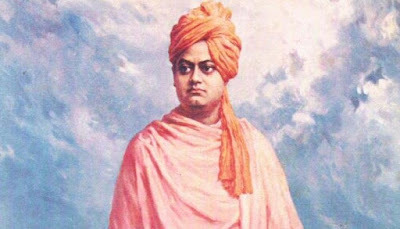 Death anniversary of Swami Vivekananda is annually observed on July 4. In 2019, it is the 117th death anniversary of Swami Vivekananda – Punyatithi or Mahasamadhi. He was the messenger who uplifted the dying spirit of Indians. He reminded them of their past glory, and their present wretched condition and what bright future hold for them. "Arise! Awake! And stop not until the goal is reached." Swami Vivekananda died at an early age of 39 on July 4, 1902. Swami Vivekananda, known in his pre-monastic life as Narendra Nath Datta, revived Vedanta and took it to the world. His mentor and Guru Sri Ramakrishna Paramahamsa guided him on the spiritual path. After the passing away of Sri Ramakrishna, under the leadership of Swami Vivekananda, disciples of Sri Ramakrishna formed a new monastic brotherhood. Swamiji was not happy with a settled monastic life. He wanted to take the teachings of his Guru to the world. For this, he set out on a discovery of real India. Swami Vivekananda was deeply moved to see the appalling poverty and backwardness of the masses. He was the first religious leader in India to understand and openly declare that the real cause of India’s downfall was the neglect of the masses. The immediate need was to provide food and other bare necessities of life to the hungry millions. For this, they should be taught improved methods of agriculture, village industries, etc. It was in this context that Vivekananda grasped the crux of the problem of poverty in India (which had escaped the attention of social reformers of his days): owing to centuries of oppression, the downtrodden masses had lost faith in their capacity to improve their lot. It was first of all necessary to infuse into their minds faith in themselves. For this they needed a life-giving, inspiring message. Swamiji found this message in the principle of the Atman, the doctrine of the potential divinity of the soul, taught in Vedanta, the ancient system of religious philosophy of India. He saw that, in spite of poverty, the masses clung to religion, but they had never been taught the life-giving, ennobling principles of Vedanta and how to apply them in practical life. spiritual knowledge to infuse in them faith in themselves and strengthen their moral sense. The next question was, how to spread these two kinds of knowledge among the masses? Through education – this was the answer that Swamiji found. We believe not only in universal toleration, but we accept all religions as true. I am proud to belong to a nation which has sheltered the persecuted and the refugees of all religions and all nations of the earth. I am proud to tell you that we have gathered in our bosom the purest remnant of the Israelites, who came to Southern India and took refuge with us in the very year in which their holy temple was shattered to pieces by Roman tyranny. I am proud to belong to the religion which has sheltered and is still fostering the remnant of the grand Zoroastrian nation. I will quote to you, brethren, a few lines from a hymn which I remember to have repeated from my earliest boyhood, which is every day repeated by millions of human beings: "As the different streams having their sources in different paths which men take through different tendencies, various though they appear, crooked or straight, all lead to Thee. This speech changed the perception of Hinduism forever. He introduced the real Hinduism to the world. 1883 to 1886 – Lectures in many cities in North America, France, and England. 1900 to 1902 – Returns to India and engages in writing and in the activities of Ramakrishna Mission. Mahasamadhi at 9:10 PM on July 4, 1902.